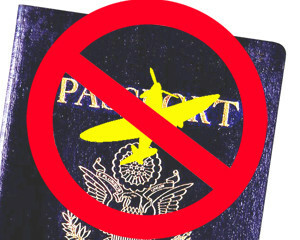 Is Your Passport Too Damaged To Fly? A Philadelphia bride made headlines this week when she was not allowed to go on her honeymoon because of damage to her passport. Newlywed Carly Baker’s dream trip was grounded by an American Airlines employee who refused to let her check in for her flight to Europe, citing damage to her passport including splitting seams and threads hanging off of the cover. Although an American Airlines supervisor later determined that the passport should still be valid, it was too late – the first clerk had already noted in Baker’s travel file that the passport was damaged, and she could not be allowed to board. The couple had to delay their honeymoon for several days, and incurred over $2000 in costs to get a new passport and re-book their travel. There is a lesson in this story for all travelers. Even though your passport may be completely valid under US State Department regulations, the State Department is not the only agency involved in getting you where you want to go. Your passport will still need to pass the scrutiny of airline employees and TSA security officials in order to get you on your flight. When you arrive in your destination country, a local immigration official will inspect your passport again, and could refuse you entry if they feel your passport is mutilated. It’s better to be safe than sorry – if your passport is starting to look rough, get a new one! If your passport is just showing wear and tear from your travels, you can apply for an early passport renewal. This sort of damage would include curling edges on pages, creased covers, or minor water damage. The threads hanging off the edge of Carly Baker’s passport would also count as normal wear and tear. Passports are considered mutilated and no longer valid if they have significant damage such as a torn, separating or detached cover, split cover seam, markings on the photo/biographical information page, heavy water damage, or pages that have been torn or cut. If your passport is this badly damaged, you will definitely not be able to use it until you have gone through the mutilated passport replacement procedure to get a new passport. Carly Baker’s story may have gone viral, but it is sadly not unique. Passport expediting companies like Rush My Passport and G3 Passports are used to getting calls from the airport from travelers who have been denied boarding because their passports were considered damaged or had insufficient validity time remaining. Before you pack your bags, check your passport to make sure it is as ready to fly as you are!